Also known as a Rottie and a Rott these well muscled dogs were once called the Rottweil Metzgerhund, which means the Butcher’s Dog. The breed is believed to be a direct descendant from drover dogs used to herd and guard the cattle that fed the Roman army, as they marched across Europe. Rottweilers are confident, powerful, intelligent, and have strong guarding instincts. Although the Rottweiler is considered a medium-sized dog, they can grow to over a 100lbs of pure muscle and raw power. This breed is rugged and built to protect with males being slightly larger than females. At four months old a male Rottweiler can weigh 50lbs and be 20 inches tall. Full grown females may get as big as 2 feet tall and weigh up to 90lbs. They are compact, agile, and have great strength. The Rottweiler has a shiny, short black coat with very distinct tan, rust, or mahogany markings. Almond-shaped, dark eyes can greet you with an intelligent, friendly look or a watchful, wait-and-see stare that’s sizing you up. Rottweilers are loyal, calm, and intelligent with a self-confident air of aloofness. These dogs have an inherent drive to protect their families and home with a strong desire to work. 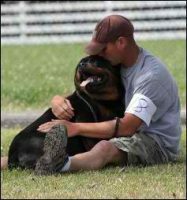 A Rottie may take a moment to warm up to people they don’t know. It is recommended that a stranger not approach a mother with pups. Rotts have a reputation for being aggressive to other male dogs, and cats. Being consistent with discipline, early socialization, giving treats for good behavior, and keeping them busy with stimulating activities will help curb the aggressive behavior. Take your puppy with you and introduce them to new people, children, other dogs and cats, exposing them to new situations. All Rotts have a strong instinct to defend and protect their families and home. Buying from a reputable breeder with paperwork to prove the lineage of the dog is the best way to ensure you receive a healthy Rottweiler. With proper vaccinations, exercise, and diet, the majority of Rottweiler dogs stay healthy. As with any purebred, large dogs, Rotties have some health concerns to watch out for. Eye Ectropion – the lower eyelid turns outward. Eye Entropion – the upper eyelid turns inward. Shoulder, Hip, and Elbow dysplasia – a crippling joint disease. von Willebrand’s disease (vWD) – an abnormality with the platelets in the blood, causing bleeding. Hypothyroidism – the decrease in hormone production in the thyroid. Panosteitis – a formation of bone growth around joints. Gastric Torsion – when the bowel twists on itself, trapping the contents of the stomach. Progressive Retinal Atrophy – a deterioration of the retina. Subaortic Stenosis – a congenital problem with the heart, causing a murmur. Osteosarcoma – a malignant bone cancer. Many of these health concerns are treatable, and preventable. The breed gained their name from a small town in Germany called, Rottweil because they played an important role in protecting and herding cattle to market. When railroads took over, the breed declined in numbers to the point of near extinction. In 1882 there was only one Rottie at the Heilbronn dog show. Founded in 1914, the Deutscher Rottweiler-Klub was the first club in Germany for the breed. The Allgemeiner Deutscher Rottweiler-Klub formed in 1921 and is considered the Rottweiler home club. The breed was officially recognized by the American Kennel Club in 1931. Rotties were shown at Crufts for the first time in 1936. By the mid-1990s the Rottie had reached such a level of popularity they were the most registered dog by the American Kennel Club, and in 2013 they were ranked the 9th most popular dog in the U.S. Although Rotties haven’t been bred for herding for generations, puppies are still trained and dogs participate in competition. The Roman army brought the Rottweiler descendents to Europe around 74AD to herd and protect their cattle. For the next 200 years the dogs were bred for their guarding and herding instincts. In the middle ages, traveling butchers used them to pull carts of meat to market and guard the money by wearing a pouch under their neck. Rotties played roles in both WWI and WWII as guard dogs, messengers, and litter bearers for wounded soldiers. They were police dogs in the early 1900s and during WWII. With a good understanding of the Rottweiler’s personality, early socialization, and continual training they can be fun family companions. 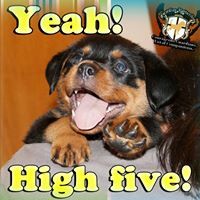 The first step to ensuring you adopt a friendly, healthy Rott is buying from a reputable breeder with an outstanding record. Reputable breeders have paperwork and genealogy charts to prove the dog’s breeding line.